Just a quick one to mention that there are only 3 classes left this year!! First up will be a week long intensive on fabricating large mosaic installations preferably permanently, but I will also go over how to go large with the possibility of later moving the mosaic. It’s going to be awesome!!! I cover everything from design enlargement to fabrication to installation and grouting. November 15 – 22 in my Canberra home-studio. Details in image below. Marian Shapiro is then going to join us from teh Blue Mountains for two, one-day workshops on December 6 & 7. If you register for both classes there is a discount! Workshop 1 is “Understanding Andamento” where Marian will go over the visual grammar of mosaics. Workshop 2 is one that she’s already taught a few years back with much success: “Bend, Fold & Undulate” where participants will learn to create their own 3D substrates that well… bend, fold and undulate! More information on my website. If you are looking for some inspiration of what you can create in the Bend, Fold & Undulate class I recommend you go see the group show in Bungendore by artists Caitlin Hughes, Kate Butler & Kelly Wild. It runs at the X Gallery until December 1. Well worth the visit if you are in the area. I’m working on a couple mosaics at the moment – a mural in memory of my father and an awesome 3D piece that I can’t wait to finish creating the substrate for. Hope you’re all enjoying this beautiful Spring! 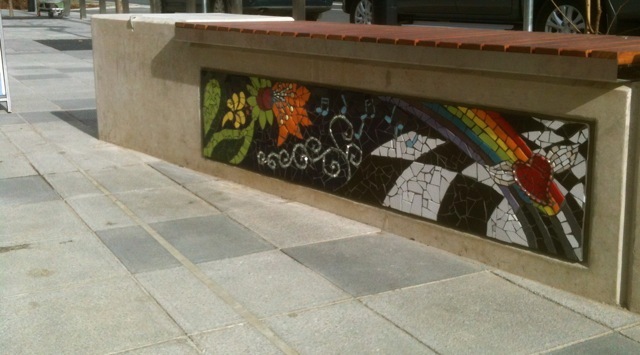 I just arrived back to Australia from attending the first International Urban Mosaic Intervention in Puente Alto, Chile. The intervention was organised by the amazing Isidora Paz Lopez, a Chilean artist responsible for the 4 km of mosaics along Puente Alto’s metro line. That was her second mosaic project. Back in August last year, Carrie Reichardt came to the MAANZ symposium as keynote speaker and mentioned the project. At the time, I thought there was no way I would be able to go. Life’s responsibilities would get in the way. In any case, due to my father’s passing I didn’t even see the Call to Artists so missed out on the opportunity anyway. At least so I thought. My good friend, Susan Crocenzi, got in touch with me as one of the artists who made the cut asking if I’d like to come along as an assistant/volunteer. I jumped at the opportunity thinking that at the very least it would be amazing to experience and watch the process – possibly even documenting it all. As it became obvious that some of the original lineup were no longer going to be able to go to Chile, I was told by Carrie and Susan to apply… and so I did. I still made plans to come along though my anthem at that time was the Clash’s “Should I Stay or Should I Go?” until finally I just bit the bullet and bought my flight over. Within a few days of me doing that, I received an email from Isidora inviting me to be part of the project on an official basis. It all seemed too good to be true. I had found some good friends who I trusted to look after my animals and house. My kids spent the month with my Mum down at the coast. Even my chickens went to stay on a beautiful farm. It was too easy – this never happens and so my decision was made to GO! In a way it happening so quickly, leaving me no time to really prepare, was a blessing in disguise. I made the decision before I left not to think about a design – in fact I had little time to and the time I did was the few days before I left which I spent down the coast. I treated it as a holiday as I knew this trip was not going to be one, as fun as it was. I also made the decision to use only what was provided to me and not bring any materials along, create pieces on mesh etc. Seriously, who had time for that? and I just want to live in the moment! were the two things going through my mind. The first three days of the project were spent with me arguing with myself about these two statements. LOL. It wasn’t pretty 😉 I did however purchase a brand spankin’ new pair of Starretts – probably the best purchase I made as they definitely helped my hands not get as wrecked as some of the artists. I walked away with callouses only and no blisters. I feel blessed! I also packed some knee pads. I thought I was being a total dork when I did it, but was 100% validated when bumping into Gary Drostle in Valparaiso before the project had started and him mentioning that he too brought knee pads, ha! I arrived in Chile early January. Met with Susan in the customs line of the airport as our planes arrived and funnily enough left at similar times. We headed straight to Valparaiso on the coastline of Chile. It’s a fairly small city bursting at the seams with amazing street art. Loved it there and it reminded me a little of parts of San Francisco where I lived for a few years. I gave my Spanish a good crack on this trip and must say considering it’s been over 20 years since I really used it, I left Chile being able to understand near everything that was being said or at the very least getting the gist of the conversation. There weren’t many Chileans who knew English, so there was really no opportunity not to use what I did have. In fact I was trilingual on this trip as there were a number of French artists who were a part of the project. Knowing more than one language is so important! I’m thinking that I will go and join a Spanish conversation class or group just to keep it up. What with all the spare time I have! It was my first time in South America. Having always travelled alone, I never wanted to do South America or Africa on my own so never went to either. I have to say Chile is a great country to travel around. Easy to just get on a bus and go anywhere. If I had more time I would have liked to have gone north to the desert to see the night sky and south to perhaps Chiloé and further south into Patagonia. Alas, time was not so kind to me and I had to come back to be responsible – work and raise my kids! Not that I mind. Next time I will bring them with me. Travel affords a certain perspective on Life and my kids are now at a good age to travel. Though they have done a pretty good amount of travel already. Nevertheless, I came back from this trip thinking of all the adventures I’m going to go on with the kids this year. It is after all the Chinese New Year of the Horse (Happy New Year!) and I intend on getting back in the saddle (see what I did there?!). I fell in love with the prawns in Chile. They know just how to cook them and my fave dish was a prawn and garlic dish. Heavenly! Papas Fritas made it to my table on several occasions, of course because anyone who doesn’t like hot chips is weird. Port workers were on strike for pretty much the entirety of our stay which meant that all the agricultural products stayed in Chile. Their fresh produce was amazing! Massive, seriously I bought an onion almost the size of my head!! The avocado was sweet, luscious and oh man… nothing like I’ve ever tasted! And everything tasted better with watermelon or rockmelon for dessert. The first day of the project arrived. Susan and I had already nestled into our lovely 2 bedroom apartment in the heart of Santiago. We were up early, navigated the metro during rush hour and we deserve a medal for being the well oiled machine we came to be!!! Seriously, if ever you had issues with personal space, the Santiago metro system just beats it out of you. We finally made it to the Municipal Building of Puente Alto after a few wrong metro station turns, which we would call work for the next 12 days and were greeted by the masses of artists (all 58 + any hangers on) from 22 countries as well as Team Chile (talking of well oiled machines!!). The official opening was officiated and we then set about deciding on where we were going to be creating each of our mosaics. Chaos ensued and for the most part, it was agreed that our numbers on the final list of artists would be where we would be situated along the wall. There was a fair bit of chopping and changing as a number of artists had come as a group and so therefore wanted their panels all next to each other. I think for the most part everyone successfully located themselves a section they were happy with and the drawing begun. Isidora and her team had already spent the weekend sketching out images on the pre-prepared walls along the theme of “Magic Garden” with images of local flora and fauna. I’ll be honest and say for me, I found this really off putting. I guess because I was expecting a blank canvas and I still didn’t have anything in mind for a design. Just a few ideas milling around my head. It also hadn’t been made clear that these images were to be used as a guide only so I felt like I had to use the image of the daytura on my section somehow. While everyone was busy sketching out their final designs, I was still struggling with the daytura and left day 1 not feeling great with my lack of design as I hadn’t done anything that felt real to me. Later that evening, in the cool of our apartment it took me all of 5 minutes to sketch out what I wanted to do. Struggle #1: working amongst a lot of people, outside in the heat and chaos that is a group project was really difficult for me! I couldn’t concentrate. Turns out most of us were going through similar emotions and doubts of our abilities. Most of us are lone rangers, working in the comfort of our studios alone. It was interesting hearing that I wasn’t the only one who at first had a hard time with being comfortable in this new environment. By the end of it we were all fine but this was an interesting obstacle some of us had to get over. I should also mention that the way I work involves a lot of procrastination. That said, that procrastination is me thinking a lot. Arguably too much. But I spend a lot of time on design concepts etc. drawing and redrawing. Once I’m happy with my design I can then come out into the world and start to play a lot more confidently. I simply didn’t have the time for this to-ing and fro-ing so I’m particularly happy with the fact that I managed to get something on the wall, didn’t use one of the Chilean artists to do the sketching for me and that my design echoes me and my own sentiments. It’s definitely my style. Day 2. I had come at least with an idea in mind! Win! I then went back and forth about this daytura… again. I put my head up long enough to see what others had done so far and spotted a gnome. It was at this point that I decided to completely eliminate my struggle with this daytura and go with my own design as so many other artists had already done. I realised that other artists were considering Magic quite heavily in the theme of Magic Garden too. The whole concept of realism freaked me out as I don’t do realism. It isn’t my thing, I have no interest in it though can still appreciate it. It was also apparent that all the other work was very colourful, showy and attention grabbing, As soon as I freed myself from using another person’s drawing, everything fell into place and I also made the decision that I would create a piece that was still, calming and more subdued in contrast to what everyone else was doing. I sketched the outline up on my section and started cutting and laying tile. Phew. I felt like I was getting somewhere. I also had a better look at the tile that was available to us. There was a shipping container full of ceramic tile across the road in a carpark. This is where we would have to go to get our tile and where we all packed our things at the end of the day. Team Chile did bring our buckets to us of a morning and of an afternoon packed away anything we weren’t using but ultimately we were responsible for getting anything we needed and putting it all back at the end of the day. At first glance there appeared to be a lot of different colours. Thinking about it now, we actually were quite limited in our palette. All the colours were well represented but I don’t know that there was a large variety of each hue. We also ran out of certain tiles fairly quickly and these were not replaced so the challenge was getting what you needed ahead of time. It resulted in some resource guarding issues! I went back and forth on colour choices and for the most part was lucky enough to be able to find what I wanted/needed. I did have to go scavenging in the last few days for a particular green and managed to find just enough. Tile was an assortment of 6-8mm ceramic varying from mid to high fire tile. I seemed to use a lot of the hire fire tile which is where my Starretts came in very handy!! I actually dislike using low fire tile I must say and don’t stock it in my studio for many reasons. Some of the tile I would never think of using if I ever saw it in a tile shop. It was a real eye opener as that same tile ended up looking great within the mosaics. I’ll certainly be selecting tiles with a different approach I think! I beleive it was Day 2 that the Mayor put on a luncheon for all the artists at a nearby park. We were given a lovely Chilean dish called Pastel de Choclo, some good Chilean wine (I’m a fan of the red!) and fruit to finish it all off. Day 3 & 4, I was still setting tile but it didn’t look like I was getting anywhere. I did start to feel a little concerned that I wouldn’t finish in time. There was no consistent information coming through about whether it was expected that we complete our mosaic. Some said we didn’t have to do the background, others said we did. What we knew for certain was that Team Chile would be grouting. I had set myself a few goals in doing this mosaic: one was that I wasn’t going to use the local artists to draw for me, the other was that I really wanted to complete the mosaic, background and all so I had to keep my design along the KISS principle. I was still in two minds about grouting – I never call a mosaic complete until after it is grouted so I was struggling with the idea that we were not going to be able to grout our own mosaic and I really wanted to see my finished work grouted as the grout can make it look so different. That said the upside was that we were not going to have to grout our own mosaic. In the words of the effervescent Susan Crocenzi: “It’s hard being me!!”. It was finally on the fourth day that I also gave up on wishing/arguing with myself that I had not brought over particular materials. I don’t think I have ever not used mirror in one of my murals. It’s just a given for me. I would have loved to have used mirror, especially coloured mirror in my mosaic. I did almost go buy some plain mirror and then decided no, I was being silly and really didn’t have the time nor the tools. Things would be OK… My neighbour Wendy Phillips and Kim Porelli gifted me with some small glass gems that I did end up using and am very grateful for! 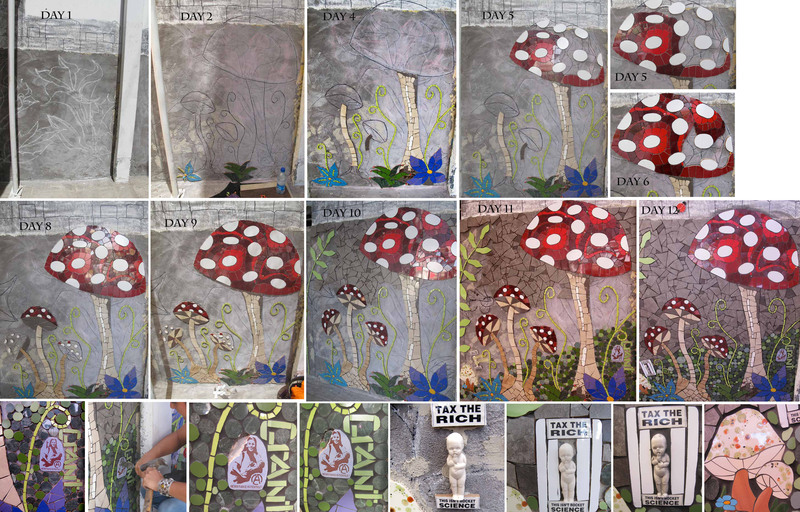 Day 5 – I started setting tile on the big mushroom cup. I spent all day and got about a third of it done. As much as I wanted to keep things simple, I didn’t want it to be totally boring either so I decided to go for a really flowy mushroom. I’m really glad I did. Day 6, being a Saturday was only an optional half day work day. Susan and I did a bit of sightseeing before heading down for some further work. It was a lovely day as there were only a few of us on site and therefore less chaotic! I managed to get more than I expected done on the mushroom cup. We were then invited to a play that evening as one of the scheduled events. I decided to pass. Exhaustion had started to set in. A week of working in the sun and mid 30 degree heat had started to wear thin and I needed to be alone. Day 7: day of partying at Isidora’s. It was her birthday throughout the week and she invited us all over to her place for festivities and swimming. I swam and slept by the pool most of the day. Week 2 was an even busier week and we knew it would be. There were events lined up for every night with artist’s presentations and dare I say it, some that went way too long!!! Please people, keep to time and relevance when giving a presentation! Going over time and under relevance meant that presentations were pushed out to another night, which was then declared that they would occur the following night so I left. As it turned out, people changed their minds AGAIN, the presentations went ahead and I missed seeing Laurel True‘s presentation. I WAS SO BUMMED!!!! And yes I did get over it but I would have much preferred her presentation over some of the ones I did stay for. The mayor also put on a cocktail night for us in the same park as the luncheon we had that included traditional Chilean cuisine as a tapas style finger food, wine and dance on the Thursday evening. Everyone was working towards the official opening on the Friday, 7pm. By Wednesday I felt certain that most of us wouldn’t finish and Team Chile would have to step in after we had left. I was wrong. A number of artists worked until the absolute last minute, but Friday was my favourite day. Everyone came together to pitch in and help. It was evident throughout the 12 days that some artists took a dislike to each other – not surprising where big egos are involved! Friday saw everyone pitching in and assisting everyone. I had already grouted my piece as I came in on Thursday absolutely determined to finish setting tile. It meant that I didn’t speak to anyone all day! Literally head down, bum up as we say here! So Friday I was a lot more relaxed and pottered around pitching in where people needed me. I helped Wendy and Kim next door to me, assisted with Susan’s background, cut and filed some leaves and set tile for Sherri Warner-Hunter, set tile for Laurel True and even got to poke in some glass rods into Stephanie Chatelet‘s mosaic. During all this time Team Chile had completely covered the front of the building. They really are a well oiled machine. I havn’t seen a bunch of people work so well together. Always laughing and having a good time, and they work fast! Well, by Day 12 we did it. It was a whirlwind of an experience, but we did it. There were many hiccups in the running of the event from either the management of or artists having personal belongings stolen, but it will be all the better for the next intervention (rumoured to be happening in Germany!). The only thing I didn’t understand was the blessing of the mosaic given by a priest at the opening. I am always “when in Rome…” when I travel, but that was kinda weird. I saw the priest come up to the podium all dolled up with his Bible so excused myself to drink in the finished artwork. What I later found out from one of the Argentinian artists was that while the priest was blessing the artwork on the Town Hall, he also blessed the people who showed up to the event including us artists. He then went on to damn those who had not come to the opening to Hell. Dang! Even my local Chilean friend thought that was odd as Chile is these days relatively diverse in its religious views and not usually so…. evangelistic. So now that I’m back home I ponder my time there and ask what I got out of it? Would I do it again? I can’t actually begin to say what I got out of it. I feel like I grew as an artist. Maybe I’ll feel that impact more as I begin work again because I learned so much from watching such a diverse group of artists work. I’m pretty sure, in fact I know, that I will approach my future projects differently. I learned a new way of seeing a mosaic and setting tile that I will start to use more in my practice. I learned a new method of double direct mosaics. I learned a whole heap more about myself: how shut down I am in certain social situations (let’s be honest, big crowds freak me out. I’m definitely a one-on-one kinda gal and have always known this but that is also the left overs of surviving an abusive relationship – still working on it after all these years! ), that I don’t need to procrastinate as much as I do in order to output decent work, that I allowed myself to get easily caught up in Life and forgot to make mosaics more of a priority, that self-doubt is normal with most if not all artists, that I’m not in any rush to make another mosaic direct, in situ even though I never thought I’d miss sitting on a bucket in the heat and sun nipping hard tile!! haha!! Would I do it all over again?! Hell yes I would! 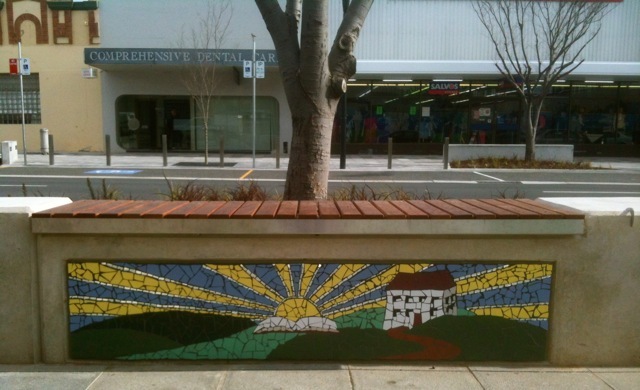 Let’s hope Isidora continues to find funding for mosaicing public buildings, lol! I can’t ever see the same thing happening in Australia, as much as I’d love to be part of organising one. What I did realise with the limited travel I did in Chile is that the people there have an appreciation for the arts that is VERY different than the appreciation here. Art appreciation here is sterile. If it’s not in a gallery, or the public art is not funded by the government or some exclusive high end organisation and made of brass or some such, it’s not art. Everywhere I went in Chile, there were murals, mosaics, you name it, it was everywhere. People liked it, expected it, accepted it and fostered street artists in particular with all kinds of festivals. When a new mural goes up, that artist rarely sought permission if ever. Street artists there are well known and appreciated. Their work is not painted over without permission. How awesome is that?! We have some awesome street artists here in Canberra and the popular views of their work is not the same! This is something I’d like to see changed as the benefits of having art in our streets seemed to me to be bigger and better than not having it. Maybe the biggest revolution we can stage as artists is to head out to our local places and colour them in. I’ve been wanting to do this for a long time and have always thought, what’s the point? It’ll only get buffed tomorrow. But maybe that is the point. Maybe the point is to colour in our world only for it to be taken away for people to realise that they are in fact missing that magical something. Like what happened in Turkey! I really think that the magnanimity of this project is yet to be realised. I’ve posted pictures of the entire project on my Facebook Page in an album called Chile Intervention 2014. It will save me a lot of time not having to upload them here, which means more time getting back to actually creating mosaics!! 🙂 I still have to finish my mural that has been a WIP for far too long. Not much more to do so I’m getting offline and creating! Next in line after that is a mosaic dedicated to my Dad which has a deadline – my Dad’s birthday! So… time to get busy! Here is the day by day of my mosaic from the project as well as the final image, larger. the gun had to go. Which I was OK with given they were allowing me to leave the rest! 2013. Done. It’s been a busy one, a sad one but at the same time a freeing, fruitful and happy one both in body of work and emotional path walking. Perhaps bittersweet is an appropriate description? 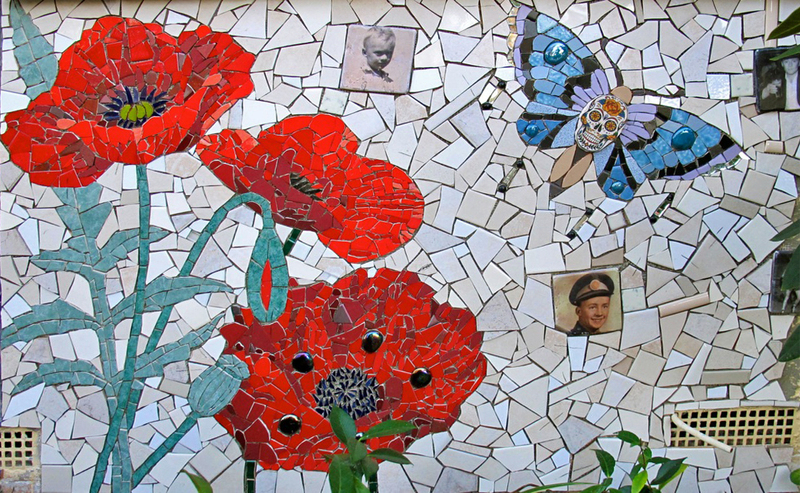 For those of you who follow me on Wastebook, you’ll know that I led another community mosaic project at Chapman Primary. It involved creating three mosaic panels with themes that were chosen by the school community: History, Sustainability and School Values. I was also given drawings and sketches that the kids themselves drew to include in the designs. 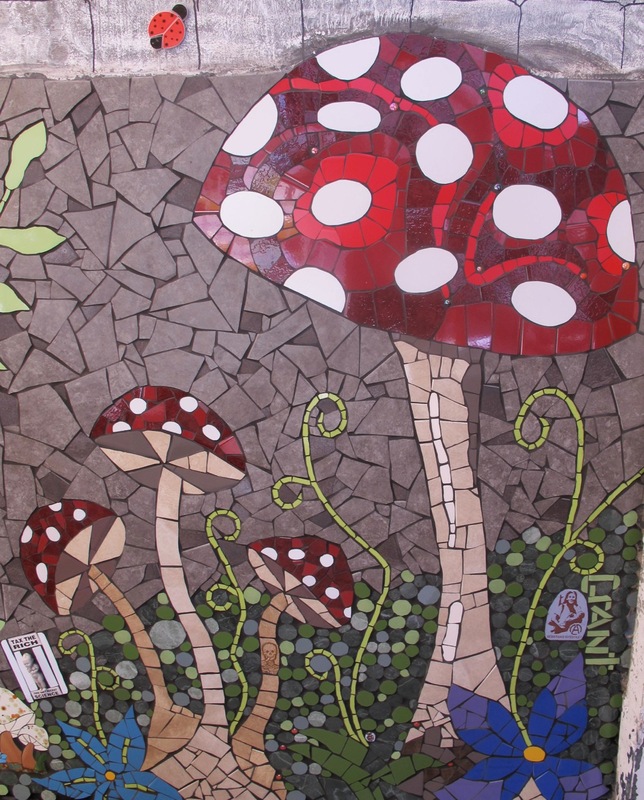 What resulted were three amazing mosaics that ALL 400 odd students and staff at the school participated in – not kidding! Preschoolers made their own tiles that were fired in the school’s kilns and embedded in concrete at the edge of a garden bed that looks out onto the three mosaics. It was a really great project, one that I am super proud of and, again, I worked with some wonderful people. I had three artists come visit throughout the year: Carol Shelkin, Susan Crocenzi and Marian Shapiro. All offering something completely different and quite distinct to their own styles. All the classes sold out so it was a testament to good ol’ Canberra!! Thank you! Though I should mention that many students did come from interstate – some as far as Western Australia!!! 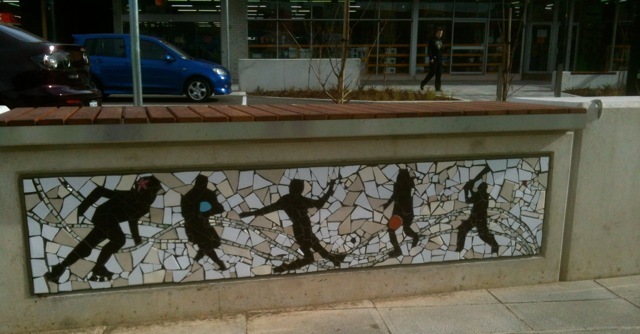 Goes to show that Mosaic Art is indeed a growing and burgeoning medium here in Australia. So great to be a part of that movement. I mentioned this year was a sad one. It was fraught with health problems with my Dad and sadly he passed away in September. There is nothing quite like the grief of losing a loved one. He was very present in my life, stepping in to look after my children when necessary and generally helping me out so he played a large role in all our lives. I don’t miss the hours of waiting in the Emergency Departments, the ongoing discussions with nurses and doctors trying to get information that sometimes I don’t think they even knew. I do however miss our lunches and dinners, miss his phone calls and miss driving in the car with him (the cranky old bugger!!). I’m grateful of my time with him. I didn’t take that for granted in those last few years even though no one could have possibly predicted that he would be gone so quickly. I’m grateful that he is no longer suffering. Grateful that he was a role model to my children – the only real man in my life and theirs. I know that all three will carry that in them to adulthood and I find absolute comfort in that. He was a good man, a family man, served for his country and was loved by many. At the end of the day, what more of a legacy would you want to leave?! We gave him a good send off, one that I think he would have been really touched by actually! People came from all walks of his life – friends from his watering hole to old RAAF mates to judges from the Supreme and Magistrates Court. That was Dad though. He could get along with anyone. I have in mind a memory mosaic with some of his personal artefacts that I came across after he passed. I also have a mural planned on my home. Right after he passed away I got right into creating photo transfers on tile and figured out how to create them for outdoor use. It ended up being a coping mechanism for me and in doing it I actually also found a voice for something I’d been trying to express for a while. Was a cathartic experience and I’m looking forward to including the tiles in my work. Also looking forward to perhaps investing in a kiln… but that’s a complete aside. I’ve also been setting about, slowly adding to the mosaic murals on my home. I now know pretty much all the designs and where they will go. At the moment it all boils down to time to fabricate and I’ve been so exhausted that I can’t really look at fabricating the way I used to. So it’s a little at a time. In fact I set about with this mural differently to the way that I normally do: I decided to fabricate a few sections and install then grout as I go as space has become a bit of a premium here in my humble abode. It’s worked out well actually. There’s really not much more to do on this one. In fact it’s been about a year since I designed this. I came up with this design whilst with my Dad on one of his many trips to hospital. So there is something very special here for me. It also includes my daughter’s loveflies. I had never really thought about it but turns out that all the murals on my home (when I get to finishing them) will actually hold a lot of significance from my life. It wasn’t a conscious approach, but I realised how true this is whilst working on this. I also set up a GoFund me campaign to which you can still contribute! The wider community so far contributed 99% of the goal. I was rather taken aback to be perfectly honest. There are great people in this world and to be part of such a great mosaic community fills me with great joy! Thank you all!!! I managed to get to the MAANZ symposium in August as well. It was great being able to catch up with some old friends, see their work and meet a few new people (one of whom is an artist I’ve long had a crush on, Carrie Reichardt). Last but not least, here is a snapshot of my 2014 schedule. Some new classes and a mural class!!! I’m even going to open up a Canberra Mosaic Tour. We have some fantastic mosaics in this town and I know where they all are!! Head over to my website to click on the name of the class you are interested in for a description. There’s other super exciting news in the works too and I will definitely write about it all in 2014! To those of you in my life who have made 2013 an EMPOWERING one (and I know you all know who you are), thank you. You’ve come into my life this year or have been around for a while. 2013 has been the year that I’ve finally realised (thanks to you) things about myself that I didn’t realise I possessed. Walking that path has been difficult post abusive marriage, I’m not lying, but 5 years later I’m stronger than I ever have been both physically and emotionally. I can honestly look back on this year and be proud of what I’ve achieved both on a personal front and a professional one. Peace, love and harmony for 2014. You know how I said I was gonna grab life by the metaphorical balls?! Yep. I’m doing it and so far it appears I’m doing it right!! I decided earlier this year that I was going to choose different in life. Well not really different. Just to not be afraid of certain things and outcomes that may never be. Choose to live fearlessly perhaps, which was more my natural state when I was young. We condescend the young and tell them they are naive. I don’t know that it is a wise thing to be condescending! The battles of life have left their mark, to be sure, but I am determined to not allow them to rule my life. After having come out of a marriage that can only be characterised as abusive, I fell into a funk that I just didn’t know how to get out of. Looking back on it, hindsight being what it is, there were times I didn’t even know I was in a funk! I would often see these annoying quotes: choose happiness bla bla. It’s not that simple people. Grief is a necessary emotion. You have to go through all of it to be able to get to the other side and to the point of deciding that enough is enough and that you are able to see it (whatever ‘it’ is for any given person) as a choice (which, mind you, is often not even a conscious decision at the time). Either that or you make the same mistakes all over again, which I will NOT do. Well, after 5 odd years I think I’ve finally arrived at that place and am thinking I might just make it my home!! One day at a time though. Trusting in people again does not come naturally anymore as it turns out. Humans can be so cruel and there are many a day when I wonder at human nature. But I’m still here and I have to live in Life. I think I finally understand that with all of my being (brain AND heart AND everything in between) and once again can see that there is such beauty lying there too. A few years back I discovered some street art that I instantly fell in love with. In fact, the way I described my reaction at the time was “totally, completely and utterly besotted!!!”. I’ll admit that I don’t always see art that makes me feel. Truly feel something, anything! Understand, too,that Canberra has a very singular idea of art and public art in particular. After having lived OS for a number of years, in particular San Francisco, and having resided in the Mission District where (great) art was on every surface pretty much, returning to Canberra was a real kick in the gut in the sense of colour, fun, amazing, wonder was concerned. Anyway, I would come across this artist’s work and get excited. Like, excited-excited, butterflies excited. I always thought how cool it would be to collaborate – since their designs seemed mosaic friendly but pretty much left it there and enjoyed the moments when I discovered another piece out in the world, getting cranky when they’d get “cleaned” up and thinking how cool and how pure (for wont of a better word) that street art can be. Sometimes it’s such a gift and the artists are not asking for anything in return. As a series of fortunate events, I happened upon their work on the interwebs earlier this year, discovering at the very least the name they went by. Abyss .607. Hmm… I like it… Gimme more… FB page and yesss… An in! 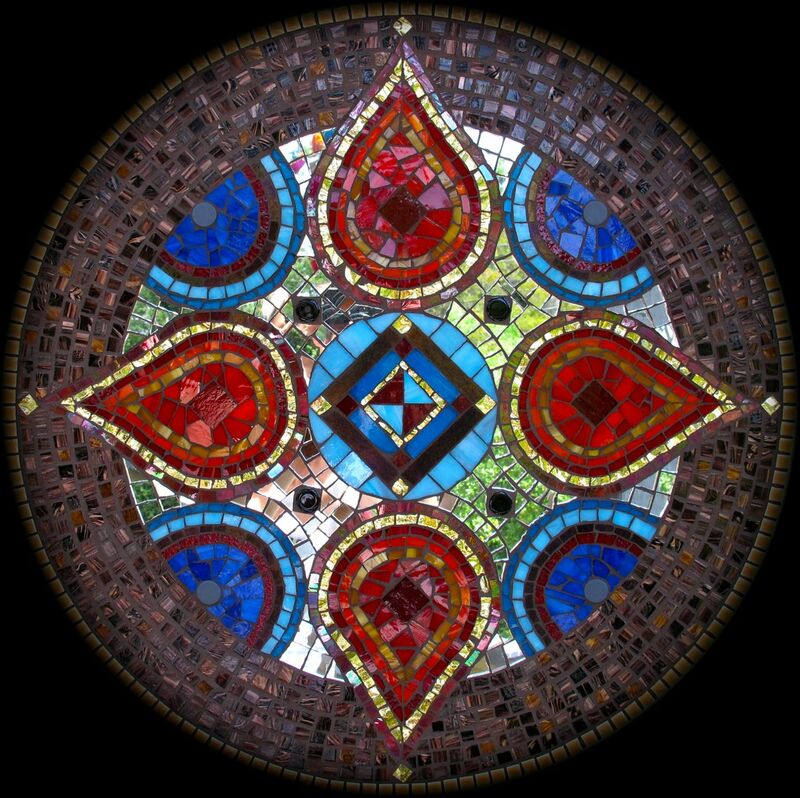 It took me almost a month to work up the courage to email the artist and ask if they might be interested in a potential commission where I would then mosaic their artwork. It’s a BIG ask and a lot of trust to allow someone else (you don’t know) interpret your work in another medium… In all honesty I probs would have said no (I was expecting a no) but he said YES! I picked up the work the other day… Am just a li’l excited (read: frikkin’ over the moon baby!). It’s massive. WAY bigger than I expected!! Sometimes it really pays off to put yourself out there. And now I have a responsibility to do another artist’s work justice. It’s pressure. I hope I don’t disappoint! He mentioned he’d like to come over once completed and spray some finishing touches on the tile. Does it get better than this? Nope. Not at the moment. All of a sudden the Universe is conspiring to get my creative juices going again. Yes. When I am not being my cynical self, I’m some crazed new age freak (not really) who believes that there is a reason for everything (really)!! I’ve been very conscious of just how uncreative I’ve felt these last few years. Where once I was quite prolific in the work I put out, I suddenly lost my mojo. It is an incredibly disturbing thing to happen. But it’s back it seems and I do intend on having a love affair with it. I have the mural with Abyss to fabricate, as well as another mural that I sketched out one afternoon while in hospital with my Dad. Designs never come so easy. Designs are often my achilles heel – they take me weeks, months… It’s ready to go. Ready. to. Go!!! Not only that but the finishing touches is about to be applied to another mural – yet another collaboration with my gorgeous sister of one of her beautiful mermaids. She’s adding fish and an octopus to it. Then it needs to be scaled and enlarged and all the other stuff that goes into fabricating murals. Three murals yeah? And to top it all off? I have an assistant! Not to mention all the sculptural stuff I wanna try out. My house is gonna be the best on the block yo! Well. Sort of. I need to get busy and actually start. Ha! 2013 y’all! I still feel like I’m in the 90s. Or maybe I’ve finally arrived at “that” time in my life – being stuck in a particular time warp. Quick catch up! I miss this place. Where once upon a time I blogged every other day or week, it has seriously fallen off my radar. But, this year is looking to be ah-mazing! After a particularly difficult 2012 where I fell into a bit of a funk and didn’t know how to get out, things bubbled up and I found the courage to make many a change and potential difference in my life and that of my kids’. Even if these changes are not supported, not successful, I’ll know that they have made a positive difference and that’s all that counts. Turns out that taking out the trash is a very cathartic experience, especially when the trash was just someone else’s crap that they dumped in my backyard. We are all in such a good place. Finally! A new community project with students at Chapman Primary School – Yeah! Nearly coming to an end of the community project with the Queanbeyan council and there has been discussion of possible further projects with them. Yes! Last year I asked one of my repeat students if she’d be interested in assisting me in some of my personal projects. I’m hopeful this will work out as she’s truly lovely and I really like the way she works. There will be an introduction soon! I’ve been re-working an old design, getting what was in my head out on paper, based on my sister’s mermaids. Just a couple more elements to add and she should be ready to go – though the enlarging on this one will be interesting… It’s a big’un. Teaching online? Mmhmm! This has been running through my head for some time now and out of the blue one of my first clients who commissioned me to make Odette, got in touch to ask if I’d be interested. So the rundown is this – AU$75/hr. I use either Skype or Facetime. I will cater the lesson plan to your needs/your project and also generalise the information where appropriate so that you can feel confident that what you are creating will last in the area that you live. I am not one of those teachers who tells you what products to buy and then leaves it at that. I get into the details of what to look for in a product and why so that no matter where you are in the world, no matter what the climate is, you have the know-how to source what you need for the project at hand. I feel this is a much more empowering method of teaching and learning. I also include class notes as a pdf. Interested? Email me! Susan Crocenzi will be teaching her popular class “TEMPERED, TRANSPARENT & TEXTURED GLASS AND POLYMER CLAY TILES” August 30, 31 and September 1. Susan hails from Northern California in the USA. If you have ever been to one of my classes you will recognise one of the below pieces, Crossroads, which she made for me back in 2008. It sits on my wall in my living room. Hard to miss really and always admired. Don’t miss out on this opportunity! I don’t know when or if she’ll ever be back! Places are limited. Besides, the reunion of Susan and Crossroads will be a thing to behold! Check out my website for full details on the Visiting Artists Series and check back for Carol’s workshop – my copy of Dreamweaver has just gone bust so I’m unable to update it immediately! Community projects? Yep – They’re continuing! 🙂 I’ve just been commissioned by Chapman Primary School to work with staff and students there to create three murals that will be permanently installed out the front of the school. The murals are all in celebration of Canberra’s centenary. Exciting stuff! Themes for the three of them have been decided upon. It’s now a matter of designing, enlarging and coding the murals for a term 2 start (no biggie!!). Deadline is the beginning of term 4 with an unveiling in Week 2 of that term as this is Children’s week. We even have rosters ready to go for all students in all years and when they will work on the mosaics. I love how organised this school is. We’ve just completed the seventh panel for the Crawford st precinct. Pretty satisfying! The kids and staff at the Axis Youth Centre made their panel, mostly independently of me. They should be really proud of themselves! I think they did a great job. I’ve also just got the Landcare group started with theirs. Their theme is River Life. I’m looking forward to how this will turn out! A few finishing touches on the design for the HOME in Queanbeyan panel and the design will be hopefully OK’d by them! Last but not least is a playgroup of 3-5 year olds! Design yet to be determined, but as the playgroup is for Indigenous children it will involve Indigenous elements. 🙂 Almost there! The Mosaic Association of Australia and New Zealand (MAANZ) is hosting another Symposium, this time located in Melbourne. I will be there. Keynote speaker is UK craftivist, Carrie Reichardt (not Dusciana Bravura as previously advertised by MAANZ). Carrie is AWESOME!!! It’s going to be pretty bloody amazing! I was lucky enough to grab one of Carrie’s flying eyeball mosaics last year. Proudly hanging out the front of my home waiting to be included into a larger mosaic. Grab life by the cojones! That’s the theme for my year! Life is too short. Sometimes I feel like the world is moving around me in fast motion – everyone so busy going here, going there. It’s nice to not feel like I need to participate in all that. Just sit back and watch, potter around in my garden, so to speak. Things are blossoming in my metaphorical garden, but I admit to sometimes wishing I had more time. I’d like more time to read. I’d like more time to devote to my other hobbies: crochet, roller derby and more recently raising chickens. I’d like more time to spend with my kids. Sometimes I feel cheated that I can’t spend more time with them – that’s probably been the harshest wound that divorce brings. By the same token, it is also a gift in that we cherish our time together. The last year or so has also brought many lessons both good and challenging. Lessons are always a gift, even if hard to swallow. What it meant was that I didn’t create as much as I had planned. Not even sure that I had planned much. I still, however, feel that procrastination is in fact a good thing. There’s a lot that is happening in the quagmire of one’s brain whilst playing in a different stomping ground and I’ve learned to embrace it. Through embracing it, I feel like I am more confident in certain areas of what I do and so now I allow myself the time I need to process, even if subconsciously. What I have started to do is make my own projects a priority. I finally got some concrete poured and created a floor mosaic. So it’s not finished… yet! But I’m almost there. Literally less than a square foot left to do! Part of it lies on the floor in my living room at present. I look at it, and look at it some more. And while I look at it and work away on this, I’m thinking about my other projects. I recently learned that I have had some of my work published in a book. I havn’t yet seen the book, but lots of great artists in there and I’m very stoked I got in!! Lastly, I am still teaching. I’ve made a few changes but for now am keeping with the classes I have always offered. 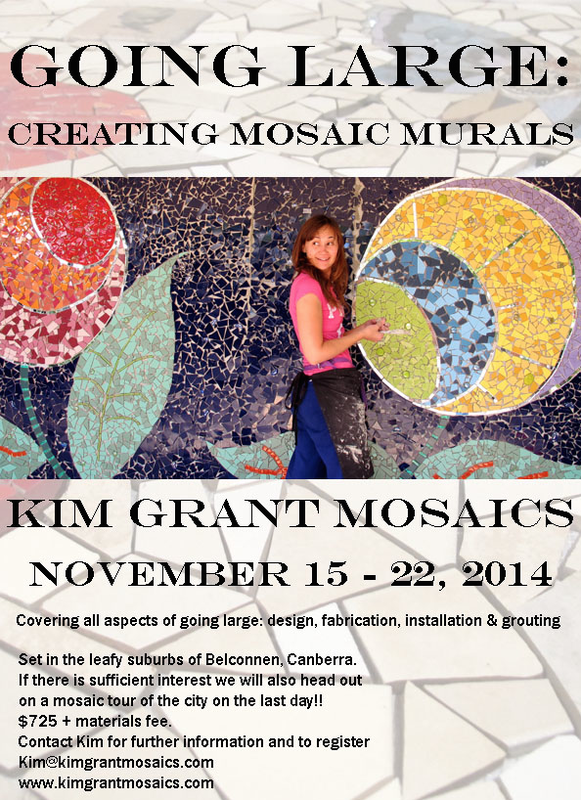 Registrations for all mosaic classes are on my website. 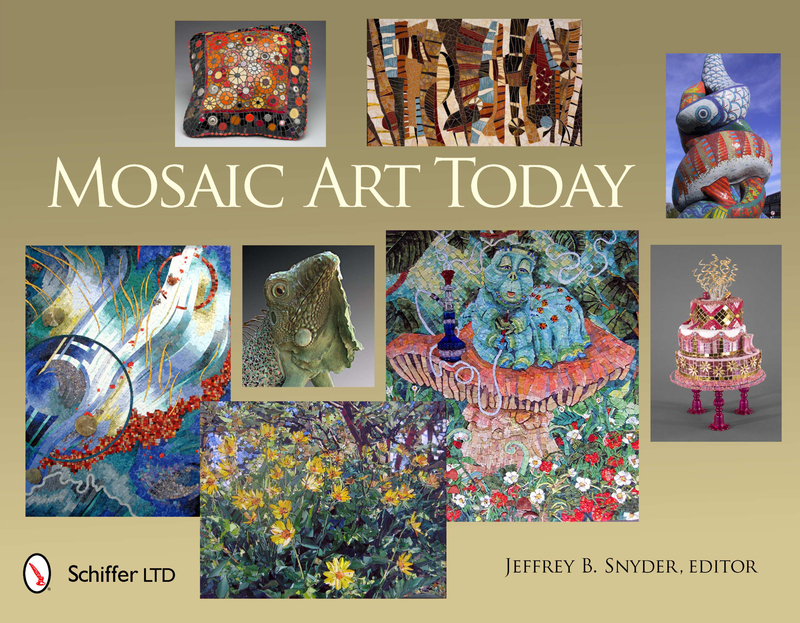 This semester they include the basic mosaic classes as well as a Mosaics on Mesh class and a glass class (Patterns & Shapes: Push-in Technique). Next year will see at least one or two new classes which I’m quite excited about. It’ll also be nice to teach some new things!! As I’ve mentioned previously I was contacted a little while ago by a public primary school here in Canberra to lead a mosaic project with their students. What came out of the brief discussions we had was to create a feature mural and some extra mosaics that will float around the courtyard. The theme of which is a macro garden. I went away and created a design that fit to the brief, but that was also going to be simple enough for a whole school to participate in. In my opinion, too much detail can be overwhelming. I also like stylised designs, as I suppose one can tell from my work. I suggested some colour themes and created colour packs for them to refer to, but emphasised that these were suggestions only. I think ownership comes from choice in process and it was important to me not to take that away. I worked in small groups with kids once a week and the teacher leading the project worked with kids throughout the rest of the week. All the kids cottoned onto the hows and whys pretty easily and then took the information and passed it on to their peers who had not yet participated. As we fabricated, the kids made changes to some of the colour selections. 🙂 The kids have been so great! Most of the panels have been fabricated already. There was always a lot of interesting conversation, a lot of problem solving (not only of the mosaic, but also of social matters in their lives). It was a lot of fun to listen to them all talk. Of course, the part they loved the most was smashing tiles! “When I grow up, I want to be an artist” and “This is so fun, I wish we could do it all day”, amongst many other uber cool other statements. Yesterday I started on the installation. One of the teachers walked past while I was working and she said to me “you are such an inspiration to these kids.” I wasn’t too sure what she meant by this and after chatting with her she remarked on me being a woman doing what I am doing and how it is inspiring for kids, both male and female, to see me creating large scale mosaics: teaching, fabricating, installing etc… I never thought of it like this. Ever! Wow. It was a pretty empowering moment and one that makes me feel like I am on the right path for me. I am exactly where I should be. Anyway, a year 6 teacher was keen for her kids to be involved. They’ll be assisting me in the rest of the installation as well as grouting the project which will basically happen next week and the week after which puts us in line to completion for the end of term. I also had a number of students discuss with me the name of the mural. They came up with Midnight Flowers, which I thought was way cool. We settled on Midnight Garden, after some discussion, to include the whole scope of the project. Big THANKYOUS to all those involved: students, parents of the community and teachers, in particular Hazel who is leading the project from the school perspective and the Principal, Lindsay whose understanding of the value of art for children is invaluable.